It was a fantastic way to spend a Saturday! 200 bands, 20 venues, one day. 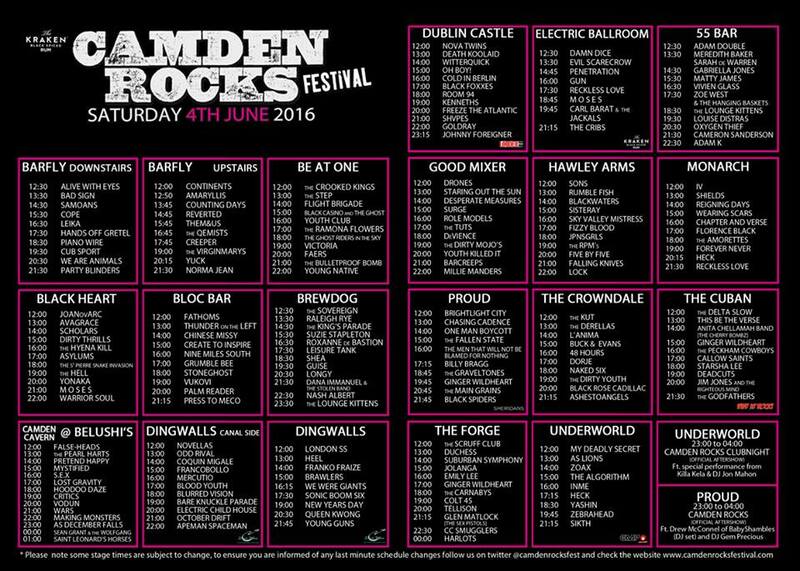 Camden Rocks Festival is a must for any rock and metal fans who want to catch their favourite bands or discover new ones. I went with a plan to see 4 of my favourites. That meant that I didn’t really get to see many new bands, although I did catch a couple of other bands before those that I went to see. I think with this kind of festival, you need to plan ahead if you want to get the most out of it. There were people I saw who turned up with lists of the bands they were planning to see, others were using highlighter pens to mark up the handy gig guide that was available free to anyone who attended. There were a few impossible choices to be made. Several bands that I would have wanted to see were playing at the same time as other bands. That’s the only downside to this type of event. First stop when arriving at the festival was the World’s End pub to collect my wristband for the day. I got there quite early, so stopped off for a coffee before going to see my first band of the day. I was keen to see As Lions because I like what I’ve heard of their music online and also the singer is Bruce Dickinson’s son, and I’ve been an Iron Maiden fan for as long as I can remember. As Lions played at 1 p.m. in The Underworld, which is next door to the World’s End, so I didn’t have far to travel for that! As it was early, the venue was not very full. I think many people turned up later in the day. They played both of the tracks that I’m familiar with from the Internet, their excellent debut single “The Fall” and their latest “White Flags”. They also played a new song that sounded great “One by One”, which is from a new EP, I think, scheduled for release soon. Their set was for half an hour and even though I wasn’t very familiar with their music I really enjoyed it. They have a heavy metal/hard rock sound. I’m looking forward to hearing more from them. 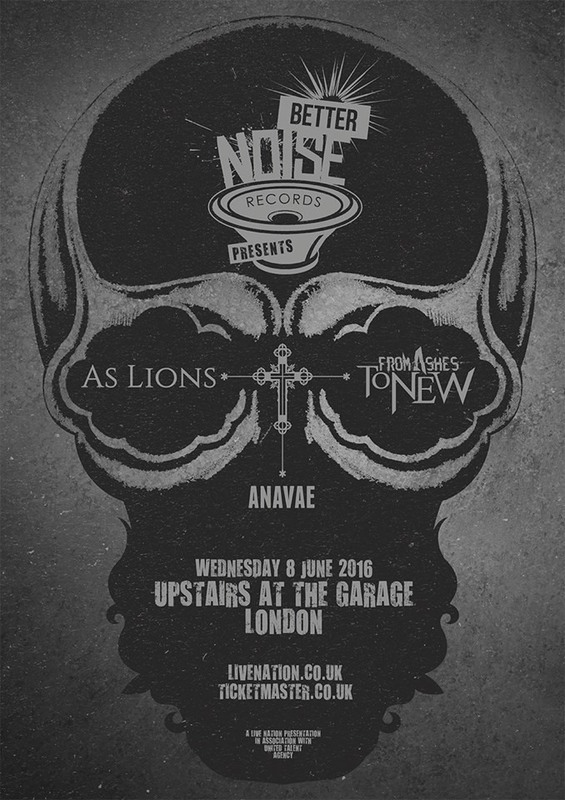 They are playing Upstairs at The Garage, London, on Wednesday 8th June, with From Ashes to New and Anavae. 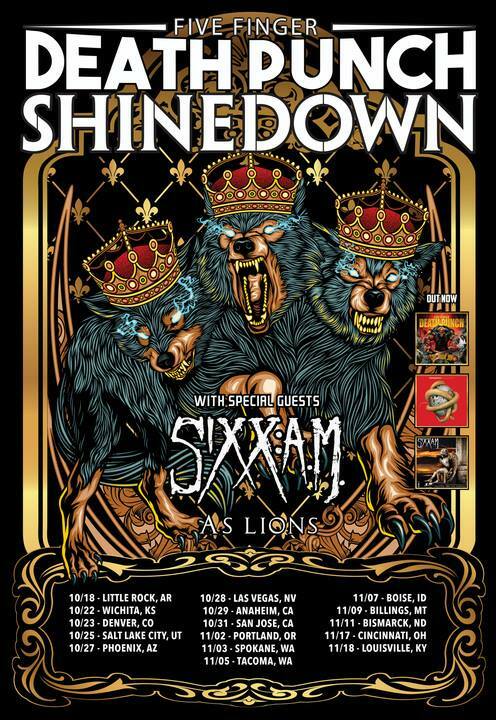 They will also be playing the Download festival, and they will be touring with Five Finger Death Punch, Sixx:A.M., and Shinedown in the US this autumn! So catch them if you can. They’re a fantastic live band that play with passion and really like to involve the audience. Next up for me was Dirty Thrills. I had some lunch before heading for their show as they were listed for 3 p.m. They were playing the Black Heart. 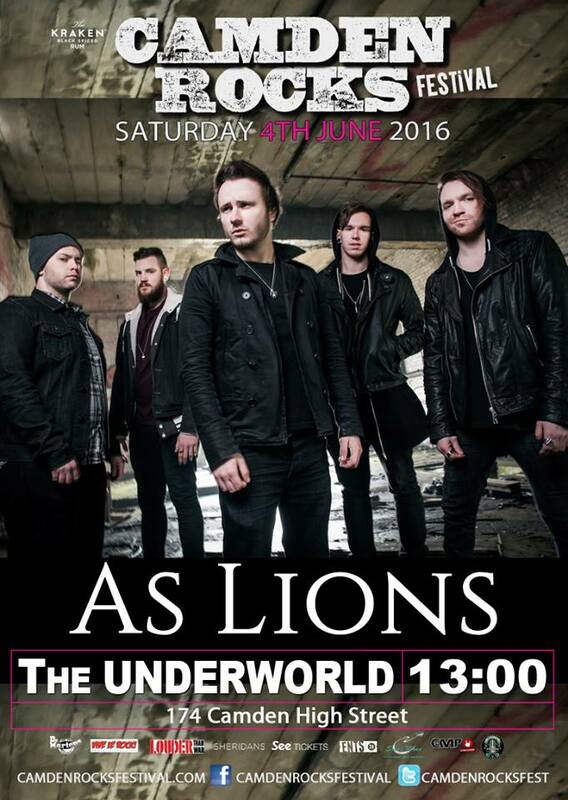 The venue is very small and the band warned fans to get there early to avoid not being able to get in. When I arrived the place was packed. I got there early and so I caught the band before Dirty Thrills, who were Scholars. I’m not familiar with their music but it sounded good and they had a lot of fans in attendance who were singing along with their songs. 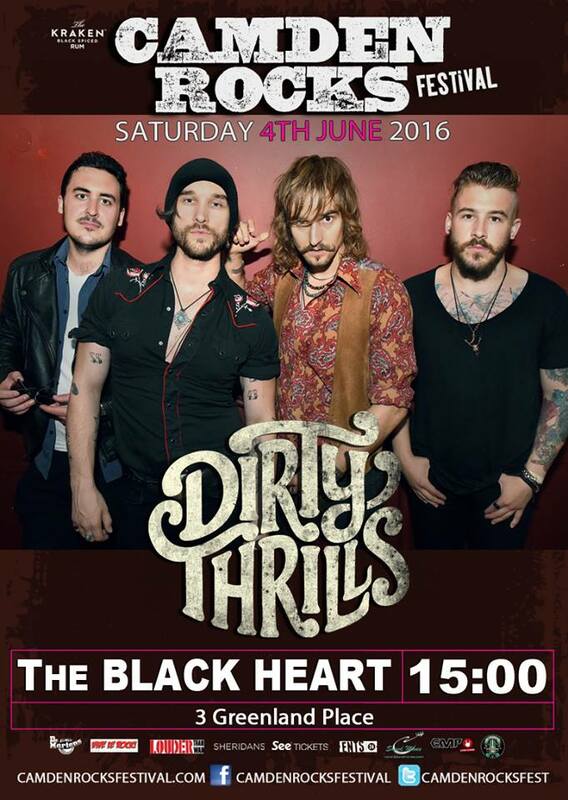 Dirty Thrills never disappoint. They were fantastic as usual. I’ve seen them play a few times now and they’ve become one of my favourite bands. Their songs are brilliant. If you have checked out their EPs or their debut album, you need to do that, especially if you like blues/rock/hard rock (Spotify: https://play.spotify.com/artist/5wDJA6WnqUgGomZGyPY9nH iTunes: https://itunes.apple.com/gb/artist/dirty-thrills/id723824216.) These guys know how to entertain a crowd and they always put on an energetic and fun live show. It was a half an hour slot and they played a few tunes from their debut album including “No Resolve”, “The Man Who Lost His Way”, “Rock and Roll” and “Sigh”. They also played “Feeling” from their latest EP as well as one of their songs from their debut EP, “Shivers”. My next stop was The Monarch to see Florence Black who were scheduled to play at 5 p.m. I wasn’t familiar with the venue and wanted to make sure I didn’t miss them, so decided to go there early. Florence Black were the band I was most eager to catch at the festival, because I’d never seen them live before. As I arrived early, I was able to see another band at the venue. Chapter and Verse were playing at 4.pm. 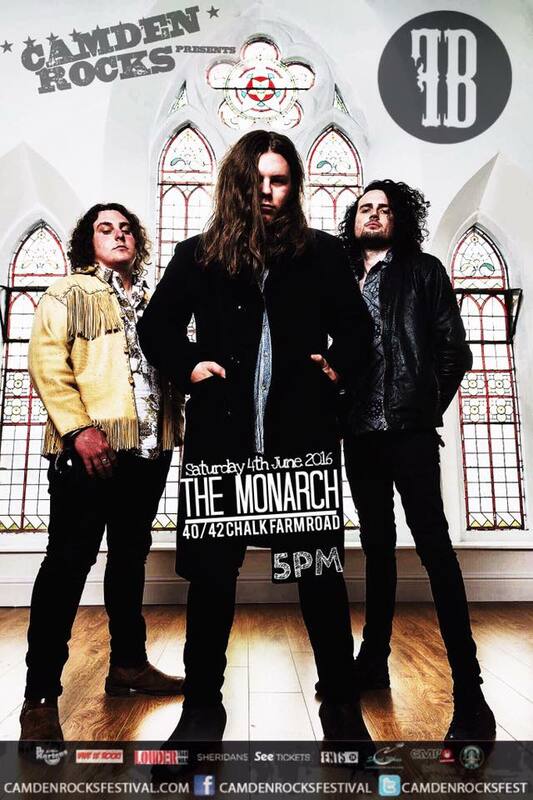 at The Monarch. I don’t think I’d heard any of their music before but had heard of their name. They played an enjoyable high energy set and their songs had some thought provoking lyrics. Next up was Florence Black. This young band hail from Wales; they released an amazing debut EP this year via Pledge Music and I just knew it would be a brilliant live show. If you haven’t heard their EP, you should head over to Soundcloud and check it out. In their half hour set, the band played three of the tracks from the EP, “Fiesta”, “Ghost”, and “Same Again”. They also played a few other songs including “Johnny”. They sound phenomenal live. This is definitely a band to watch. Their gig was one of the highlights of the festival for me. 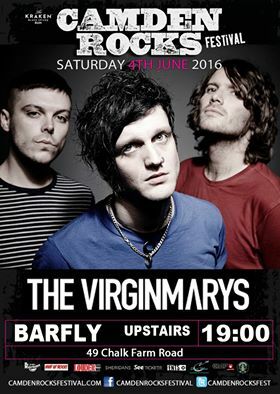 The final gig I’d planned to see was The Virginmarys. Their new album “Divides” is awesome; one of the best rock albums I’ve heard in a while (check it out on Spotify: https://play.spotify.com/album/1zWR3G6BDz7lMHXzIB8Puy). After listening to it, I was looking forward to seeing them live. As it was now later in the day and more people had arrived at the festival, and the bands were all a bit more well known, there were queues for each of the venues. I decided to join the queue outside the Barfly even though it was still over an hour until The Virginmarys were due to play. While in the queue I met one of my Facebook friends who does a lot of promotion for the band. There were also other members of The Virginmarys’ Facebook fan club in attendance. We waited for about an hour in the queue and luckily managed to get in just before the band were due on stage. All in all a fantastic day. I was glad I managed to see the bands that I’d planned to see as well as a couple of others. There were so many good bands playing the festival. I’d definitely recommend it for next year.